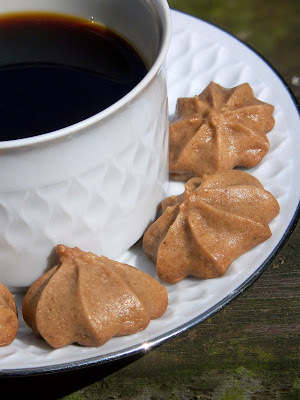 Every time I order espresso at a bar or restaurant I move over those cute little cookies it comes with to P. Biscotti di Amaretto or Amaretti are Italian cookies that are made with Amaretto and egg whites. The next time I order some espresso I am going to hand over those cookies to P. and replace them with my own. If you want to do the same, here is the recipe. As I said, usually these contain eggwhites which make the cookies – that are very similar to macaroons in texture – light and crunchy. I think the best way to imitate this texture is to use a combination of starches like corn or tapioca starch, silken tofu and soy flour. 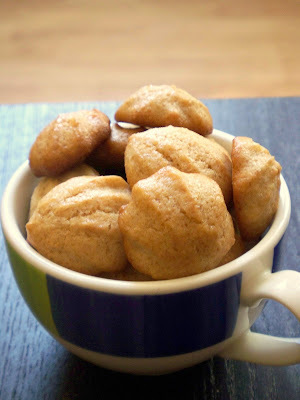 When I started experimenting with these I left those ingredients out (using soy pudding instead of tofu) and the result was a light but too soft cookie which also didn’t have the cracked surface the original versions have. My second batch already came out perfect, but I tried a third version. This time the cookies came out too soft again, so I stick with the second one. The first and the third version didn’t have soy flour in them, so this seems to be the most important ingredient (next to the silken tofu which adds the fluffiness). I made these without almonds, getting the flavour from the Amaretto and bitter almond extract. If you would like to have some ground almonds in them, feel free to replace some of the flour with it. Preheat oven to 180°C (350°F) and line two baking sheets with parchment paper. In a blender combine tofu, oil, sugar, and almond essence and blend until creamy. Fill a pastry bag (fitted with a decorating tip of your choice) with the batter and pipe small amounts onto the baking sheet. try to make them not larger than 2 cm. (0.8 inch. If you go for an inch that will be fine too) Bake for 7-9 minutes until golden brown and try to check them often as they might burn soon due to their size. 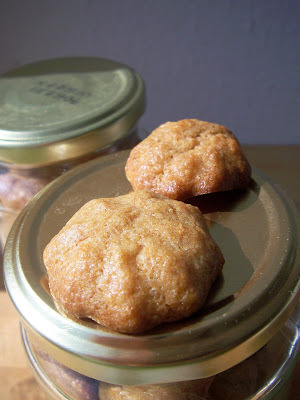 Let them cool completely and store them in an airtight container. Their taste improves over the course of a day, so try to be patient before you have your espresso with some of your own, vegan Biscotti di Amaretto. Τhis sounds very good! The first batch is the most pretty, but I know that biscotti di amaretto look more like the second batch! This is cool, i will try it! vila – 1/4 cup is 60 ml and a cup 240 ml. I think, if I remember correctly 1/4 cup silken tofu equals 80 grams. you cannot leave me with such a good rezepte and cup mesure!!! how much is a cup of silken tofu? and oil in ml?? danke!! otherwise i get crazy!!! How I love almond flavored cookies! I didn’t think these would be easily veganizable, but they certainly look identical to traditional Amaretti. You’re awesome, Mihl! this makes me want to make pasta (very green pesto maybe? ;) just so I can have these with coffee afterwards! Amaretti looks delicious! Thanks for sharing wonderful vegan recipes! Ooh the biscotti are gorgeous! They look reminiscent of a cookie that, here in the US, is called a “meringue”. These are the most adorable cookies! They sound delicious. These look amazing. Oh my! My husband will be so happy when he knows I can make these again! those look divine. thanks for the recipe, I will have to try these out! Both of those look wonderful! You rock for figuring this out! I didn’t know there was a way to imitate that texture! Thanks! amarettini are awesome! still, I think there are some brands that ARE vegan after all, I remember buying some bags of them a while ago. must check with the Italian corner shop. Wow, these look so beautiful and professional! Almond is one of my favorite flavors. Those look great! Do you have almond paste in Germany? It is vegan and I think it’s the main ingredient in some versions of amaretti. Oh, Mihl – these look just like the ones that came with the many coffees I drank in Heidelberg! I often just left them on the plate, but how cool to have a dairy-free version. You’re so inventive! Romina, I would love your opinion on those if you make them. this has always been a favorite of mine! nifty.